Westcott has introduced the Flex Cine Dimmer, a new device that can control any Flex Cine bi-color or daylight mat up to 1 x 2 feet. Available in May, Westcott said the dimmer is compatible with original Flex 1x1 and 1x2 mats with a legacy adapter. It can adjust intensity and bi-color temperature between 2800-6000K. 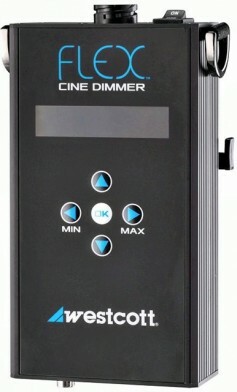 The dimmer has intuitive local controls with a digital display. WiFi control with a free dedicated mobile app is coming soon. The device includes AC power adapter and removable shoulder strap. It is compatible with most 14.4 to 26-volt V-Mount batteries. I has the ability to store four custom presets when using Flex Bi-Color Mats. Price is $449.90.